The Texas Society of Architects conducts an annual Honor Awards program recognizing exceptional members, firms, individuals, and organizations for their outstanding achievements in support of the profession of architecture, the built environment, and quality of life in Texas. Our 2019 Call for Nominations is now open. All Texas region AIA local components and current members are invited to submit nominations for our 2019 Honor Awards in the categories listed below. See nomination guidelines and individual award criteria for submittal requirements. Our 2018 Honor Awards were announced on August 9. View the announcement. Recipients were recognized at various events during our 79th Annual Conference and Design Expo, held on November 8-10 in Fort Worth. The Medal for Lifetime Achievement is awarded to a single member each year in recognition of a lifetime of distinguished leadership and dedication to architecture, the profession, and the community. The medal is the Texas Society of Architects’ highest honor. It is awarded in memory of Llewellyn W. Pitts, FAIA, to publicly recognize architects who by their example and service have made significant contributions to the advancement of the profession and to the community. 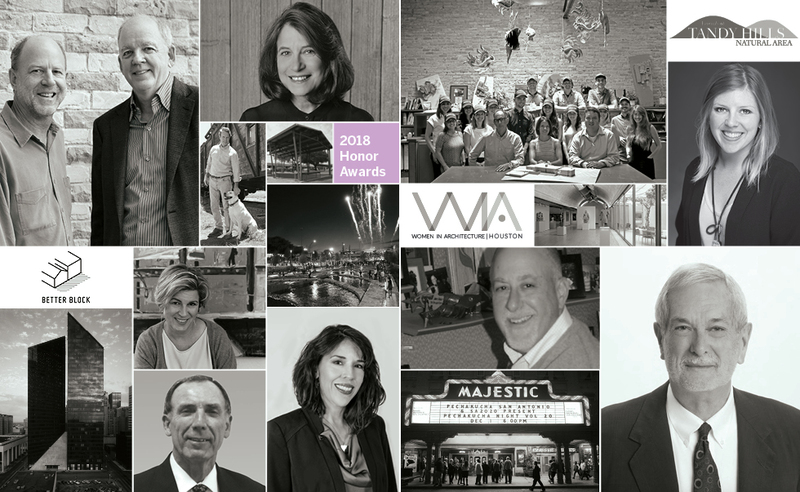 Established in 1996, the Architecture Firm Award is presented to a single Texas firm that has consistently produced distinguished architecture and has contributed significantly to the profession and the community for a period of at least 10 years. This award is the highest honor the Texas Society of Architects can confer upon an architectural firm. The Texas Society of Architects Award for Community Service recognizes a single individual member for an extended commitment to community service and/or significant contributions to the community evidenced in a positive impact on urban, environmental, or neighborhood issues. This award recognizes a single individual architectural educator for outstanding educational contributions. The Texas Society of Architects Award for Young Professional Achievement is awarded to a single architect member who has shown exceptional leadership and made significant contributions to the profession in the early stages of his or her architectural career. The Texas Society of Architects Associate Member of the Year award is presented to a single Associate AIA member who best exemplifies the highest qualities of leadership and has demonstrated an unparalleled commitment to his or her local component, or to Texas’ membership through service to the profession and/or in the community. Awarded to Texas Society of Architects members or Texas AIA components for developing unique programming for the successful development of Associate AIAs, or for an extraordinary effort to mentor and promote the advancement of these professionals at the local or state level. This award recognizes an individual or organization for excellence in the promotion of architecture through the media. Media is a broad category and can include print, radio/TV, web, and digital format. The Citation of Honor is awarded to individuals, groups, or organizations outside the profession whose activities make significant contributions in supporting the creation of safe, beautiful, and sustainable environments in Texas. The Texas Society of Architects Artisan Award is presented to individuals, groups, or organizations outside the profession whose artistry, talent, technique, diligence, creative insight, and collaborative nature support the creation of safe, beautiful, and sustainable environments and make significant contributions to the built and natural environment in Texas. Awarded to a Texas Society of Architects architect member, chapter, firm, or organization for developing unique and successful programming for the promotion of associate members in Texas or their component chapter. Visit our Honorary Members page to see list of past recipients in this category. Visit our 25-Year Award page to see list of past recipients in this category.